I haven't done a "What I Ate" post in awhile, so I figured it was about time I got back on it! I love creating these posts, & love reading them too. The nosy side of me wants to know what other people are eating.... Plus, it helps me get ideas of new things I can make for myself! These are my meals from Sunday~ breakfast, lunch, snack, & dinner. 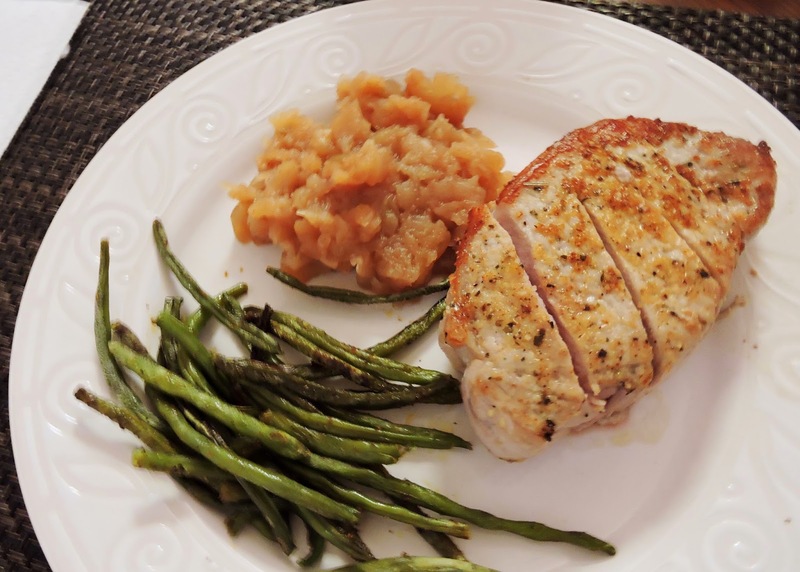 Everything is super simple & easy to prepare, yet tastes awesome! I love food too much to eat like I'm "sacrificing". 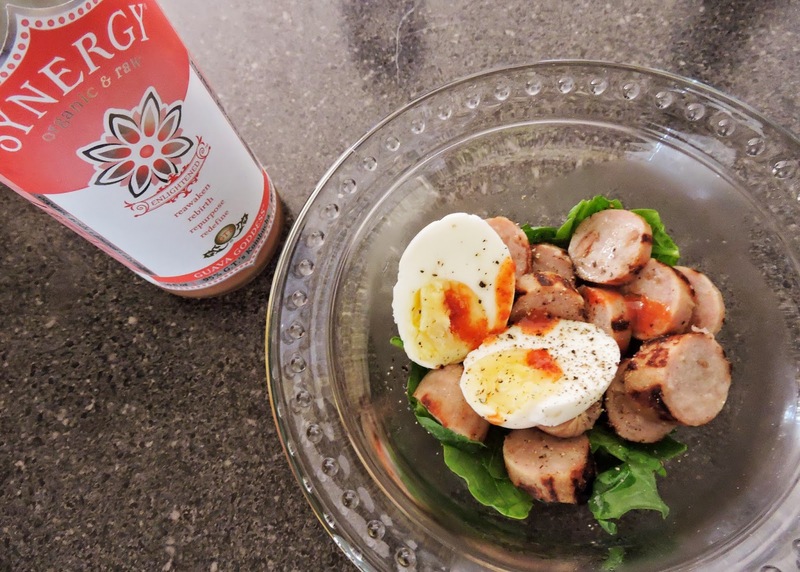 Torn spinach with a sliced up chicken apple sausage from Trader Joe's & one hard boiled egg. Drizzled with extra virgin olive oil, sprinkled with salt & pepper, and added a dash of hot sauce. I had a cup of coffee, then half of this Synergy Guava Goddess Kombucha. We keep hard boiled eggs on hand in the fridge for quick breakfasts, and pre-cook our sausages! So, all this meal needed was 30 seconds in the microwave, & it was good to go. I promise it is 100x tastier than it looks! 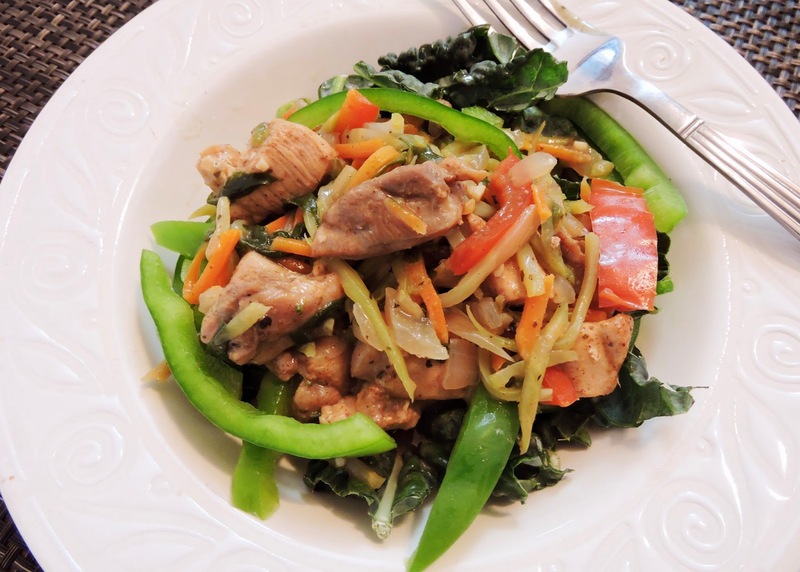 Leftover Thai Curry Chicken stir fry (recipe coming soon) served over raw kale & green bell peppers. This is what a typical lunch looks like for me~ leftovers turned into a salad with tons of veggies. 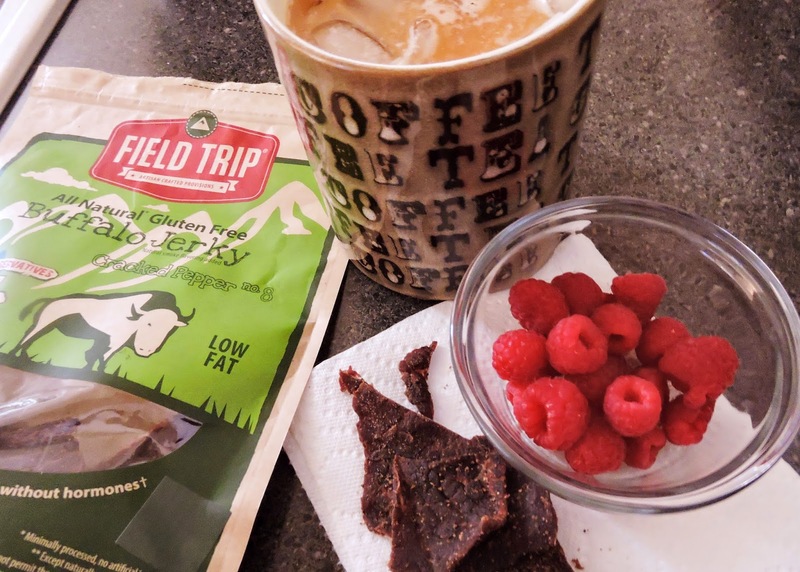 Gluten free buffalo jerky, a handful of fresh raspberries, and an iced coffee- made in my Keurig & mixed with unsweetened coconut milk & raw honey. I love sliced deli meat & jerky for a quick protein at snack time. Just look for "gluten free" & minimal sugars. This one from Field Trip is super lean & has a great classic jerky flavor. I found it at Costco! Pork chops (recipe here) served with Crispy Oven Green Beans (recipe here) and fresh, warm Baked Cinnamon Applesauce (recipe here). I hope you enjoyed my "What I Ate" post! Look out for a new cookie recipe & Trader Joe's grocery haul coming soon. Can't wait to see your Thai Curry Chicken Stir Fry recipe!